The heating/ventilation or air conditioning systems can only operate with the engine running. 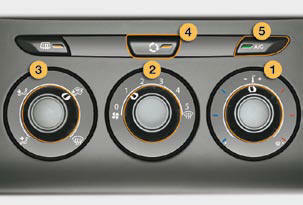 Turn the dial from position 1 to position 5 to obtain a comfortable air fl ow. If you place the air fl ow control in position 0 (deactivation of the system), the temperature is no longer maintained at a comfortable level. However, a slight fl ow of air, due to the movement of the vehicle, can still be felt. The intake of exterior air prevents misting of the windscreen and side windows. Return to exterior air intake as soon as possible to prevent deterioration of the the air quality and avoid misting. Press the button to recirculate the interior air. The indicator lamp comes on to confi rm this. Press the button again to permit the intake of exterior air. The indicator lamp switches off to confi rm this. Press the button to recirculate the cabin air. This is confi rmed by lighting of the indicator lamp. Press the button again to allow fresh air into the cabin. This is confi rmed by the indicator lamp switching off. Press the "A/C" button, the associated green indicator lamp comes on. 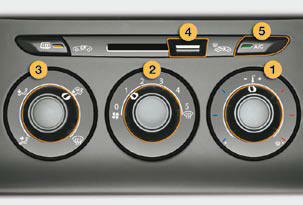 The air conditioning does not operate when the air fl ow adjustment control 2 is in position "0". Press the "A/C" button again, the associated green indicator lamp switches off.